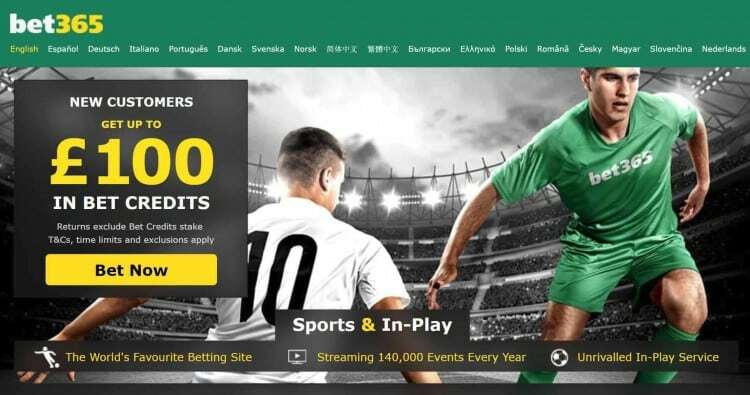 Football accumulator tips for this weekend’s Saturday afternoon matches including the reasons for each pick and which bookmaker to use on our accumulator. The Championship promotion playoffs remain the target for Bristol City and they will aim for a third successive victory when hosting Wigan. 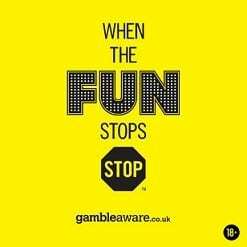 That clash features in this Saturday football accumulator alongside Fleetwood’s attempt to win a third consecutive League One game. Struggling Yeovil are also covered in League Two while National League automatic promotion points are at stake when both Leyton Orient and Salford aim to win their respective fixtures. Accumulator Odds – 12/1 with bet365. Bristol City vs Wigan Betting Tip – Bristol City win. It has been a strange few months in Championship action for Bristol City. After winning seven successive league games from late January onwards, the Robins then became winless in five outings culminating in a 1-1 home draw with struggling Ipswich. Consecutive away victories at Sheffield United and Middlesbrough suggests a return to form for City and they will hope to clinch a first win at Ashton Gate since mid-February when hosting Wigan. The visitors last won a match on their travels when beating Stoke 3-0 back in August and they have conceded at least twice during a current three-game losing sequence on away soil. Another defeat is likely for Wigan. Fleetwood vs Southend Betting Tip – Fleetwood win. A winless sequence of League One form dating back to late January contributed to the recent dismissal of Chris Powell as Southend manager and they will enter this game facing a fifth consecutive defeat with just one goal scored in the preceding four matches. Hosts Fleetwood are not the most reliable of teams but they have won their last two fixtures without conceding a goal. Joey Barton’s team do not score that many goals but having won five games since the beginning of February, they should be capable of beating Southend. Read More: See our Manchester City vs Brighton predictions for the FA Cup semi-final. Swindon vs Yeovil Betting Tip – Swindon win. Since claiming a second successive League Two victory when beating Morecambe via a late winner back in early March, the fortunes of Yeovil has declined once again with five consecutive losses incurred, just one goal netted and the dismissal of Darren Way as manager. Neale Marmon oversaw a 3-1 home defeat by Newport and the Glovers now travel to Swindon with the hosts scoring seven goals in winning their last two matches. A 3-1 win at Bury was an impressive result for Swindon last weekend and they should follow that win by overcoming struggling Yeovil. Leyton Orient vs Halifax Betting Tip – Leyton Orient win. After winning five successive National League games during March, Leyton Orient have earned just one point from their latest two fixtures as they aim to seal automatic promotion. Orient led at Bromley on Tuesday evening before being reduced to ten players and losing 2-1. Visitors Halifax have won just once in five outings and have become an inconsistent team especially on their travels. Only Dover have scored twice against the Yorkshire team in league action this year but Orient could seal a fourth consecutive competitive win at Brisbane Road, via a narrow margin. Read More: See our both teams to score tips for Saturday’s football. Maidstone vs Salford Betting Tip – Salford win. When winning only two National League games from mid-December through to the end of February, it appeared that the automatic promotion hopes of Salford had ended. However, conceding one goal and earning nineteen points from seven games during March has revived those hopes considerably. Salford needed to score two very late goals last weekend as they beat Bromley and they now visit a Maidstone team seemingly doomed to relegation. The Stones have lost six of their last eight league games and their fate will be confirmed should they suffer an expected loss. 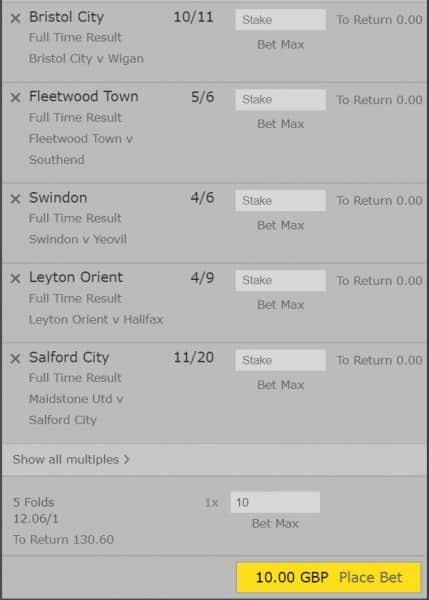 Saturday Accumulator Odds – 12/1 with bet365.